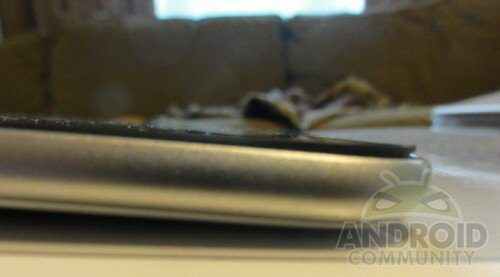 As you may probably know, Google gave away numerous Samsung Galaxy Tab 10.1 special edition units at Google I/O 2011 and apparently there have been reports that the special edition Android tablet is seeing some issues whereby the glass is separating from the chassis. According to an article over on Phandroid a tipster has let them know that attempting to push the glass back into place doesn’t really work but give the feeling that the glue is trying to attach the panel but only lasts roughly ten minutes before popping back up. The tipster isn’t the only one who has seen the problem as the guys over at Android Community are also hearing the same. Apparently the unnamed tipster also say that he noticed the problem as soon as he was given the special edition Samsung Galaxy Tab 10.1 and Google swapped the device for a new one which apparently had the same problem. The word is thus far these are the only account of the tablet issue come to light and apparently one owner contacted Samsung and they have informed him on how to solve the situation. As the Samsung Galaxy Tab 10.1 is expected to release as of the 8th of June let’s hope this wont become a widespread issue.